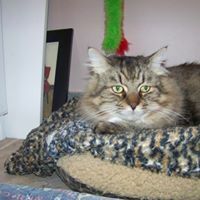 Oliver, a handsome brown tabby, was friendly, boisterous, and good-natured – he provided us with three years of affection and happiness. He loved people and was a great ambassador of the clinic. Oliver, sitting on the front desk greeting patients, and getting under our feet when running through the clinic from whatever invisible “thing” was chasing him, brought joy to all those that had the pleasure of meeting him. Oliver passed last week following a long fought battle with kidney disease. Shortly after being adopted by us in 2013, it was determined that Oliver had kidney disease; likely as a result of being exposed to leptospirosis while in his previous home. 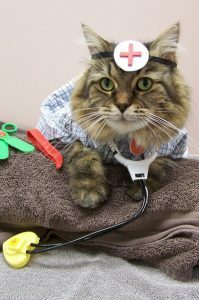 Oliver did very well during the past three years despite not always being the most cooperative patient. 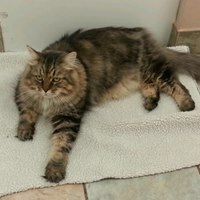 Oliver came to Hollybank Animal Hospital after being rescued by the Humane Society from an unhealthy living environment. He was first introduced to Hollybank when he underwent dental surgery to address his severe periodontal disease. He quickly won over the hearts of the staff and he found his forever home. Oliver will be dearly missed by our staff, clients and the many patients he considered friends. This news brings me to tears. Oliver was such a beautiful boy, always a comforting little boy with all the patients. I looked forward to see him every few days. My heart goes out to you all. Rest in peace sweet Oliver you will be in my heart always. I do remember Oliver. I didn’t know he died. How sad. In addition, I want to thank Dr. Roselli and her team for the last weeks trying to save my Manolo. I highly appreciate your effort and compassion. My Manolo is now happy, playing at the other side of the rainbow.